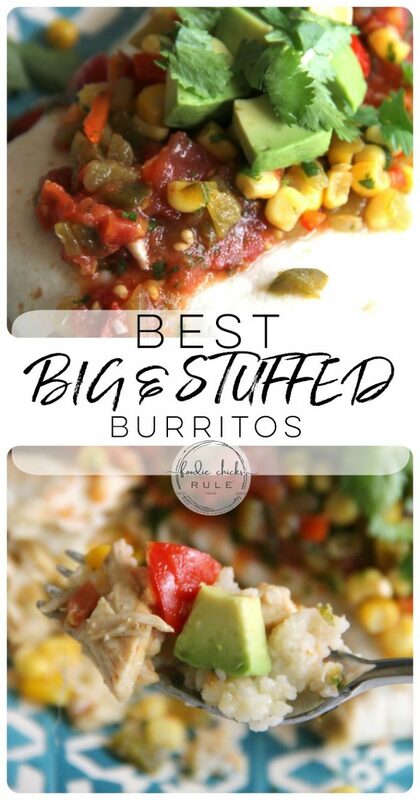 Best burritos recipe, not even kidding!! 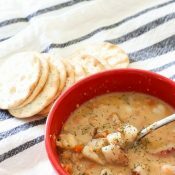 They are easy to throw together and are so stuffed full of flavor, you will love these! 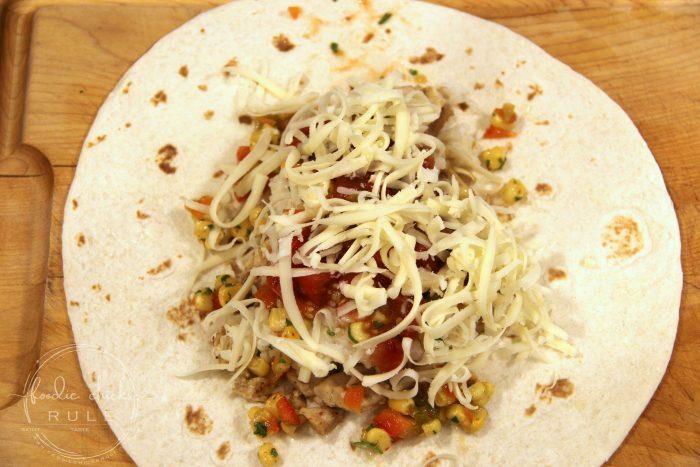 It’s finally time to make the best burritos recipe, ever! However, if you want to take a shortcut, you certainly can. 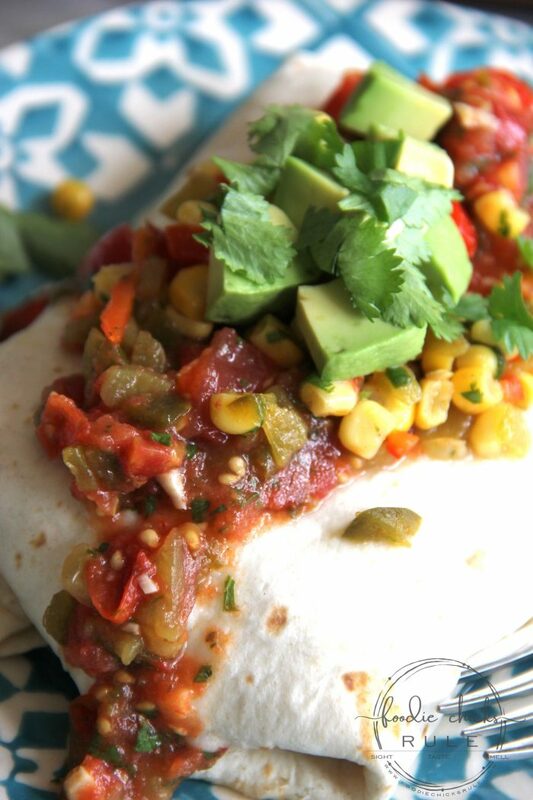 Hop on over to the grocery store and buy corn salsa (if you are able to find that prepared) and ready made salsa. It will still be good, but I don’t think it will be as good as if you’d made those ingredients from scratch. But you can if you are in a rush. 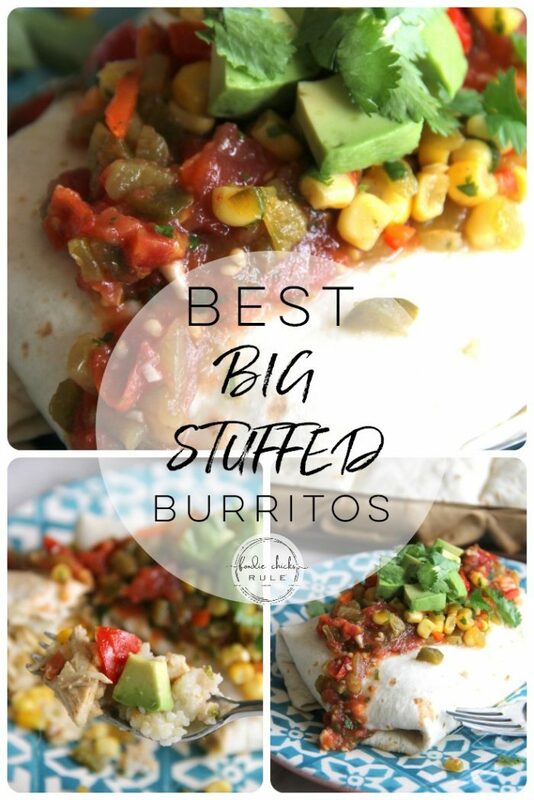 They call it their “big burrito” and it’s just filled and stuffed with the most delicious flavors. So, one of the last times I went and got my regular, “big burrito”, I paid particular attention to the flavors I was tasting and the ingredients I was seeing. 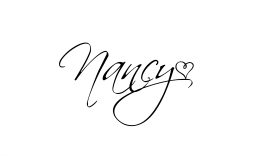 And I have to tell you, it is one of the very closest duplications I’ve ever come up with! Even my husband was surprised at how much it tasted like the restaurant’s version. So this meal is a win-win around here. 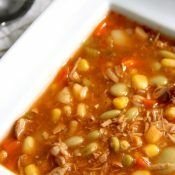 The two ingredients that go into this dish, and I mentioned above, are here….. 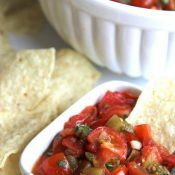 So, I shared with you guys how I make my homemade salsa. You can find that recipe, here. 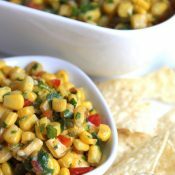 And I also shared how to make the colorful corn salsa. You can find that recipe, here. 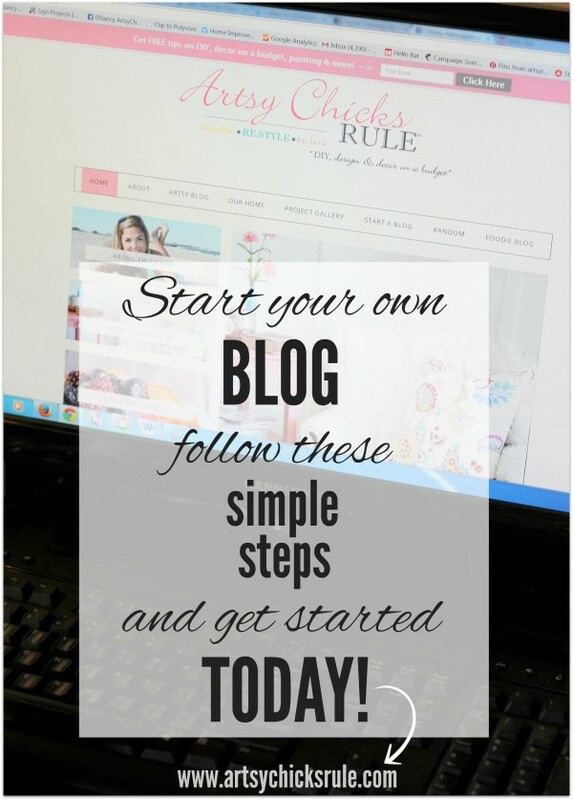 Both of those recipes will go into this one so be sure to pop over and print out the recipes for each. And using a rotisserie from the grocery store makes this roll along pretty quickly! Remove the meat from the bones and chop. Add the chicken to a pan with a splash of olive oil. Add the juice of 1/2 a lime, sprinkle with cumin, chili lime powder (I get this from Trader Joe’s but you can use regular cayenne pepper), onion powder, salt to taste and marjoram powder. Saute until heated through, set aside. 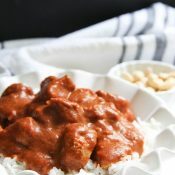 I like to use 1/2 cup of Jasmine and 1/2 of Basmati because the Jasmine gives it a bit of stickiness. I don’t like all Jasmine, however, because it’s a bit too sticky then. It’s a personal preference, so use what you like here. After it is cooked, add the juice of 1/2 lime, agave syrup, salt, olive oil and finely chopped cilantro. 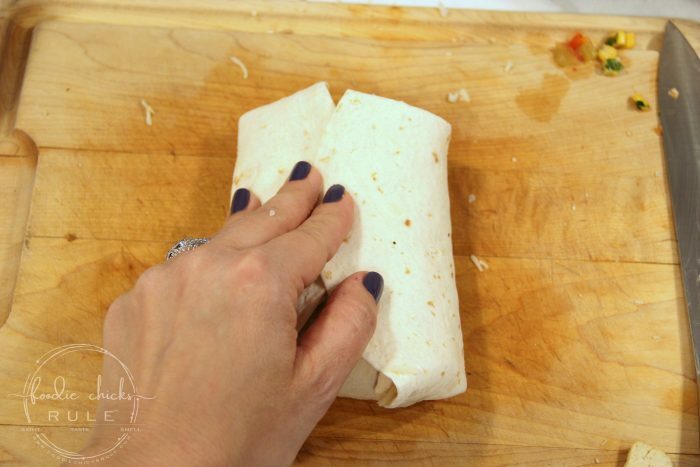 I like to space my ingredients for the big burritos like this so they are easy to make. Using large, ready made tortillas, layer a portion of chicken along the center as shown. Don’t go to the edges because you’ll need to wrap it up. Next layer a portion of rice over the chicken. Next you will layer the corn salsa and homemade salsa over this. 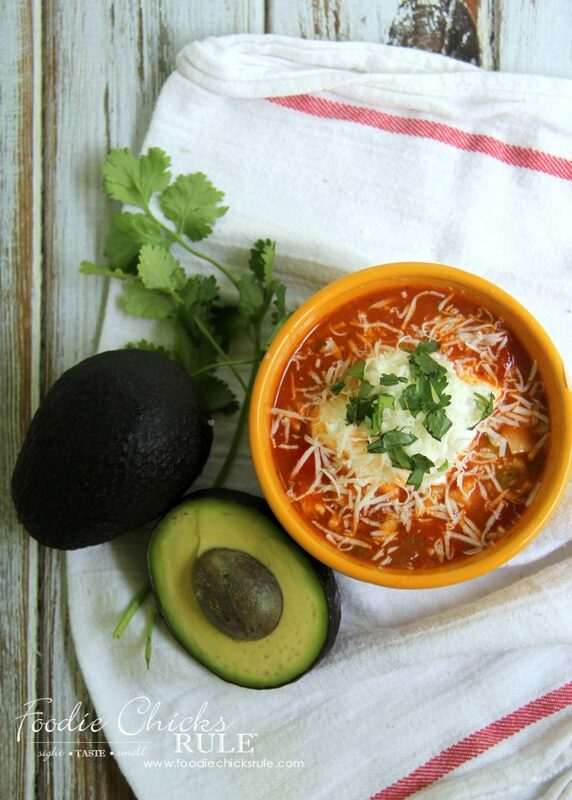 And finally, you will add the shredded Monterrey Jack cheese. Simple wrap them up, starting on either side. And finish up with folding the other 2 sides over that. 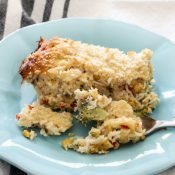 Place into a baking dish and bake for about 15 minutes at 350 degrees. I get 2 baking dishes, so 6 big burritos, out of this recipe. 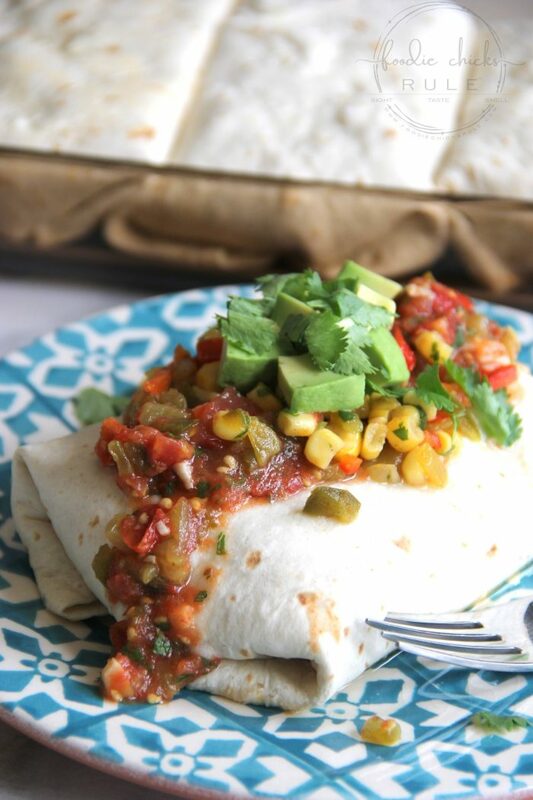 Once out of the oven and plated, you will layer another bit of red salsa and corn salsa over the top. Garnish with chopped cilantro and avocado and serve. You can also serve it with sour cream, if you like. 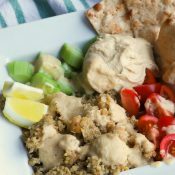 Hope you enjoy the wonderful mixture of flavors (and the delicious texture) of this dish! While the rice is cooking, remove the chicken from the bones, chop and add to a sauce pan along with 2 T of olive oil. Add the seasonings to the chicken along with the juice of 1/2 of the lime. Heat through on medium, 2-3 minutes. Remove from the heat and set aside. Once the rice is done cooking, add the juice of the remaining 1/2 lime. Add the agave, 1 T olive oil and chopped cilantro. Mix well. 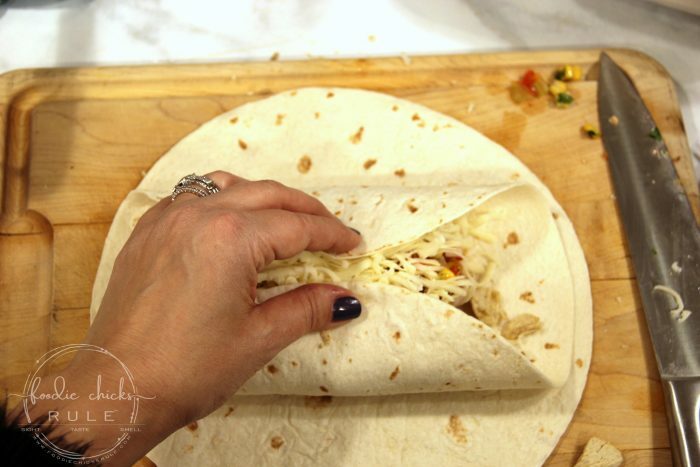 Place all ingredients in front of you for easier assembly of the burritos. 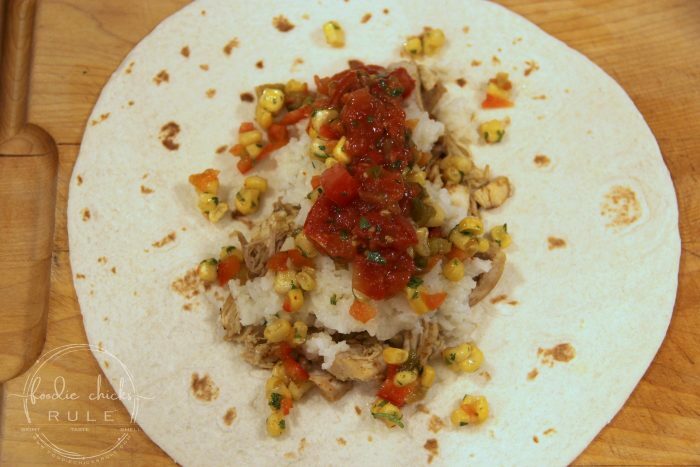 Chicken, Rice, Salsa, Corn Salsa and Tortillas. 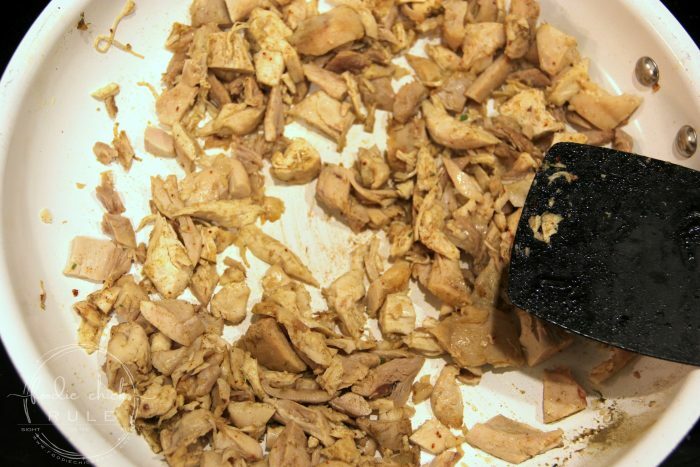 Lay out one tortilla and spoon in the chicken mixture. Be sure you leave a 1-2 inch rim around the tortilla so you can fold it once full. 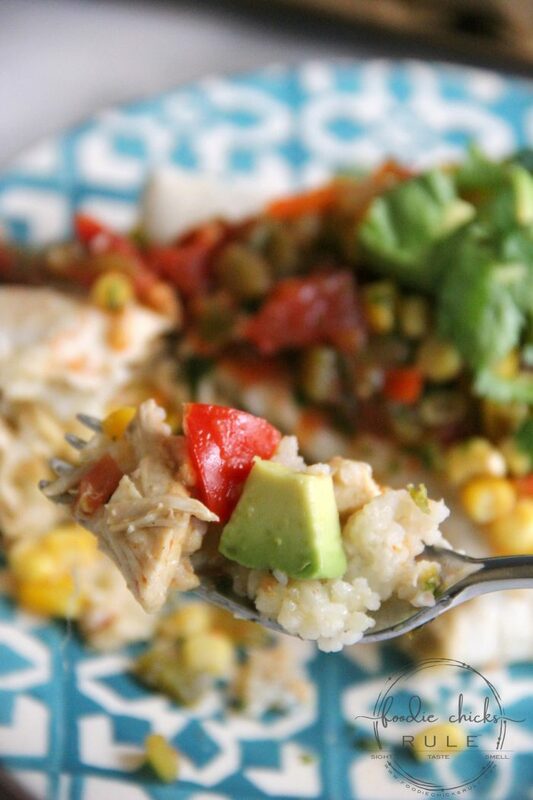 Spoon a portion of the rice mixture over the chicken, followed by the 2 salsas. Sprinkle the shredded cheese over the top of all ingredients. 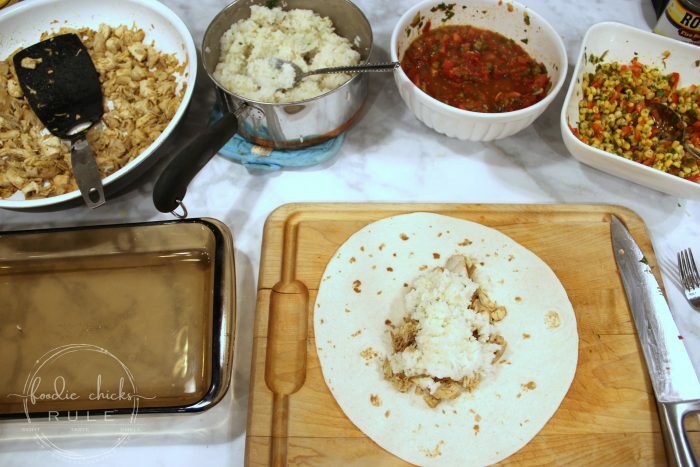 Fold the 2 sides over covering the rice/chicken mixture, then fold the other 2 sides over "closing" up the burrito. Place fold side down in a baking dish. Pack them tightly together. 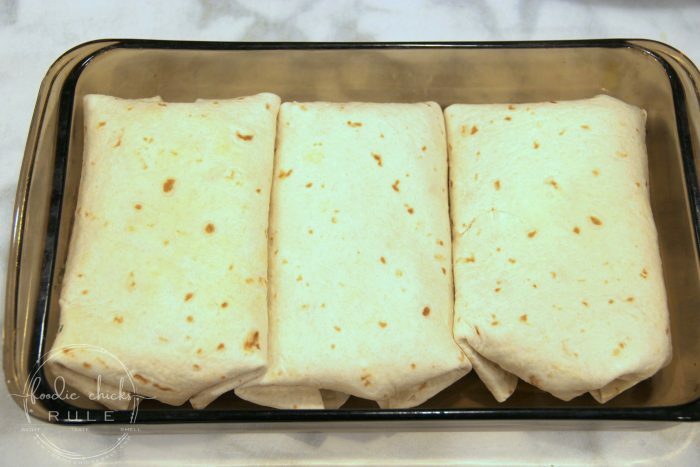 Remove from oven and place 1 burrito on a plate. Garnish with more red salsa, followed by the corn salsa, avocado cubes and chopped cilantro. 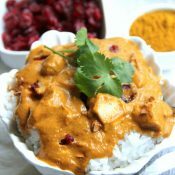 You can use all jasmine or all basmati rice, as desired. 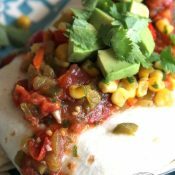 You can sub store bought salsa and corn salsa. Refried beans can be added inside the burrito if that is something you like. Sour cream may be added as an accompaniment to this dish.